Here’s a sobering thought: If you sleep seven hours a night and live for 80 years, you will have fewer than 500,000 waking hours – TOTAL. By the time you celebrated your 21st birthday you had already used more than 130,000 of them. You need to evaluate the things that are most important to you and make certain you weave them into every day you’re alive. What’s most important to you? Your loved ones? Your education? A worthy cause? Your health? Your career? Something else? It doesn’t matter which ones they are; that’s personal. It only matters that YOU know which ones and that you incorporate them into your daily existence. Don’t let the exigencies of day-to-day life distract you from what’s important. 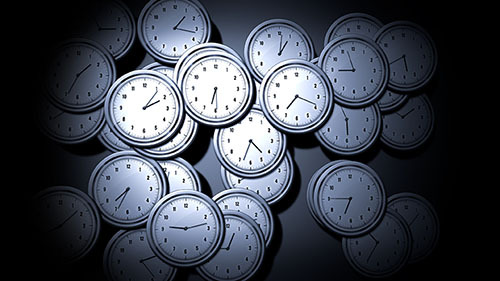 Every day subtracts another 17 waking hours from the total you have left. Prioritize your activities to make certain you FIRST work on things that will add value to your life and help you achieve your goals. Put important “to do list” items on your calendar, specifying when you will work on them. This will give them added importance and increase the chance you will complete them during the course of the day. Specify and observe an “end time,” in addition to the “start time,” for every meeting you hold or attend. This will bring focus to the meeting and can reduce the length of meetings significantly. Make certain that meetings are effective. Every meeting should include an agenda, written and distributed in advance, and you should assign specific action items to attendees. Be sure to cover the important items first and leave housekeeping items to the end. Do not automatically answer phone calls every time the phone rings. Evaluate its importance in relation to the task you are currently working on. Caller ID can help significantly in this endeavor. If you are not certain that a specific call is important when the phone rings, allow it to go to voice-mail, listen to the message and return the call immediately if necessary, or later in the day, if it’s less important than other items you are working on. Consider the importance of each e-mail on the basis of who wrote it and what the subject is. Immediately respond only when it’s more important than the activity you are working on at the moment. Answer the remaining e-mails only at specified times of the day, en masse. This will dramatically increase your effectiveness. Do not fall victim to the trap that “I can do it better, or faster, than the person working for me, so I should just do it myself. I don’t have time to train him or explain it.” Make the time today. You will gain significant time advantages as the person learns to handle the task more effectively. In addition, you will become a far better manager and your direct reports will grow more rapidly. Resist the urge to “take care of the easy things” on your “to do” list. Focus on the important items first. If you need the psychic satisfaction that comes with crossing things off the list, break important tasks into small “to do” list items that can be tackled, and crossed off, rapidly. At least then you will be making progress toward your goals.